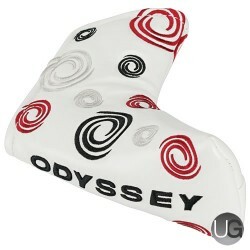 Odyssey Swirl Blade Putter Headcover White. We stock the latest Odyssey Golf Putters. Fantastic online choice and free delivery over £30. Lowest Online Golf Prices In The Midlands. Designed to fit all blade putters the Odyssey Swirl Blade Putter Headcover offers the best protection for your putter with a stylish design and fastened with a velcro strap.